In 1922, three - Walter, Arthur and Alfred - of the six sons of Samuel(1) formed a partnership trading as South Brothers, builders, with each brother having an equal one third share. Around one hundred houses were built primarily in the Tottenham area although a small development was built in Broxbourne, Herts. The main period of building activity occurred during the 1930s. An estate office was built in St Loy's Road, Tottenham, in 1938. After World War 2 the firm concentrated on war damage reparation and, thereafter, building maintenance for private customers, the South Estate and South Brothers' properties which was continued by the Exors. of A J South after South Brothers closed in 1969. 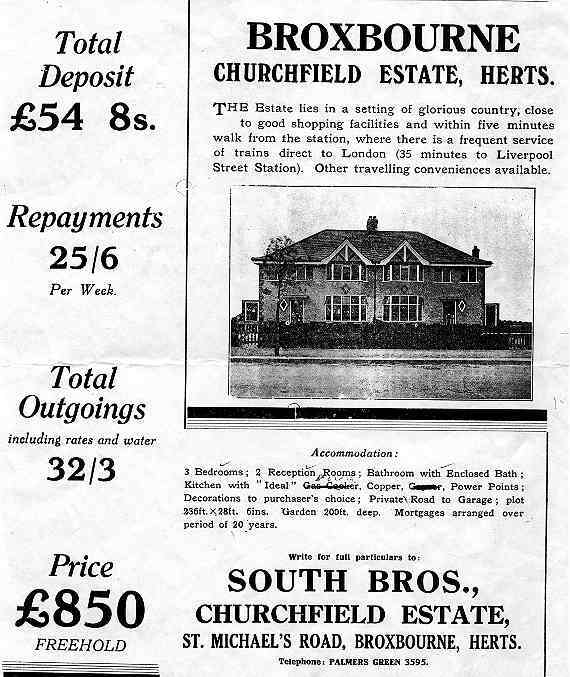 Doris South - daughter of Walter South (second son of Samuel(1)) - has kindly donated a copy of the advertisement for the small development (four pairs of semi-detached houses) undertaken by South Brothers in Broxbourne and mentioned in Update No 13. Doris lived in one of the houses from 1932 until 1964 and recalls her father saying that the profit margin was small, about £50 on each house.